This year, the JagWire editing staff has commissioned two writers full of passion and zeal over this hot button issue to give the student body their take on the candy corn debate. Freshman Taylor Stephens will be arguing against candy corn, while Sophomore Emma Vance will be advocating for it. Once you’ve read their takes, be sure to head over to the Back Page section and take our poll, so we can determine, once and for all, where the CHS student body lies. First, we present the argument in favor of Candy corn. Yellow and orange chewy goodness, it’s that time of year for a candy corn feud. Candy Corn is a staple for fall and a staple for Halloween. The ‘in between’ opinion for candy corn ceases to exist. Some strongly adore it, when others strongly detest it. My question is, how could anyone not like candy corn? There are so many uses for it despite it’s amazing taste. The issue that is most likely the root of the problem is the brand of candy corn. Brach’s is the one and only brand to buy candy corn from. Their candy corn is soft, yet chewy and still has that classic candy corn taste. Off-brand candy corn tends to have a stale, crunchy texture which isn’t what candy corn is supposed to be and probably where candy corn haters go wrong. There are so many things you can decorate with candy corn. Add them onto fall themed cupcakes, cakes, or cookies. Everyone knows that the typical fall colors are orange, yellow, and brown shades, so what could be more festive? However, candy corn isn’t subjected to only one time of the year. Valentine’s Day themed candy corn, dressed in pink colors, is also very popular. Candy corn comes in other varieties of colors as well, including pastel colors most popularly used around Easter time. Candy corn is mainly made up of just sugar alone, but that’s what we’re all asking for on Halloween, since it is the one day of the year that we celebrate indulging in pure sugar. Simply just having the sweet treat in your home around Halloween time whether you actually eat it or just have it for decoration has become quite a tradition in America. Because of this, I doubt candy corn will be going anywhere any time soon. To conclude, despite if you choose to celebrate your Halloween with a bowl of candy corn or absolutely none at all, hopefully everyone has an amazing and safe Halloween this year! And now, in opposition to candy corn. The most popular displayed candy during the fall season is very controversial. The question is whether or not people actually like it. Candy corn is known as ‘America’s Favorite Candy’ but despite this get more and more hate. Due to many reasons of ranging from ‘the flavor is to bland and tastes like too much sugar’ or ‘it burns the back of my throat when I swallow it’ people that don’t like it usually don’t like it. Is candy corn really everyone’s favorite candy during the fall season? 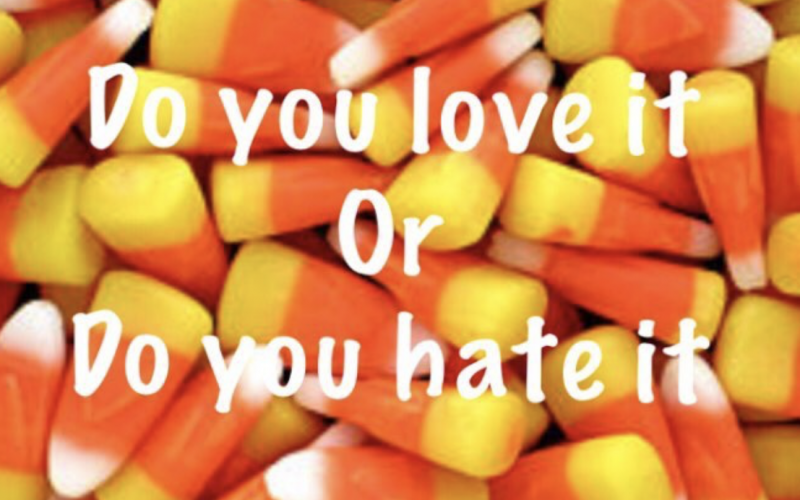 People that hate candy corn, hate candy corn. The taste of it is a big factor that comes into play while eating it and usually it is the starchy, sugary taste everyone hates. You can feel the starch the minute you continue to chew on it. Not only the taste, but the feeling of candy corn is another reason people hate it. This is due to the acidity of the candy. Brach’s is a big brand that produces pounds and pounds of candy corn during the holiday season of Halloween. There is a popular demand by many people around that time. On the ingredients list on a Brach’s 24 oz bag, there is 4 ingredients that are on the list that are considered to be acids: corn syrup, salt, artificial flavoring, and sugar. When you eat only one candy corn, you feel like you’ve dumped 4 tablespoons of sugar down your throat. Your teeth become all gritty and gross feeling. In a more real statement, 19 pieces of that gross tri-colored candy is serving you about 35 grams of sugar. The average sugar intake according to the American Heart Association says that you should be taking in is about 31 grams of sugar daily. 14 pieces of that candy corn already exceeds your sugar intake for the day! Four ingredients in the despised candy that makes people hate it. With the amount of sugar candy corn has, it shouldn’t be displayed in households around kids and adults to preserve healthy kids and adults. The popular candy corn brand, Brach’s, is now making mixed baggies called ‘Caramel Candy Corn’. These include a mix of a bunch of kernels flavored as caramel put into candy corn form. Adding to the ridiculous flavor comes more sugar and more sugary and starchy tastes. Due to more sugar also comes more of a burning throat feeling from the acidity after chewing only one of them. The nutritional facts on these bags of candy corn is say about 28 grams per 5 pieces of candy corn. To break that down, that equals to a little of 5 grams of sugar in each one of those little kernels. This candy is in popular demand by people all over leading these bags to sell for about $10.00 for a 15 oz bag. This sounds overpriced for a 15 oz bag of what they say is ‘limited edition’ candy corn. Although the only difference between this bag and the original flavored bag is on the caramel bag, it say ‘Limited Edition’. I believe that the demand of this flavored candy corn is due to the slogan on the bag that says limited edition. When a brand of some sort places something, including words, pictures, or phrases, people tend to buy it. Companies put this slogan of limited edition on the bag so that people would look at it and want to try it, misleading the consumer into paying an exorbitant price for a mediocre good. The amount of people liking candy corn is slowly going down due to the fake sugary taste and the burning sensation many people get after swallowing them. Brands are continuing to make different kinds of corn including shapes and sizes to try and get people to buy more and more, trying to reel customers back in. But as more people begin to begin to realize how much sugar it brings to themselves and family in their household, they stop buying it. Candy corn is an well known candy by many people, mainly because it has been around for many generations. But as people begin to figure out how bad candy corn is for you and your teeth and health, people will continuously put an end to buying this colored candy. Both sides of the like or dislike issue of Candy Corn was presented well. I like it. It wouldn’t be Halloween without it!